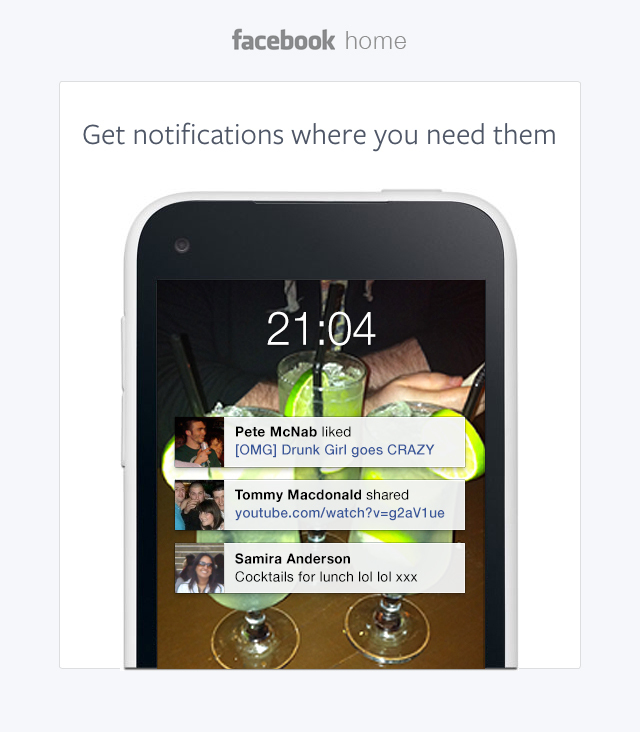 Facebook Home, the replacement homescreen for your mobile phone, has just been announced. The preview looks absolutely beautiful - not something I'd use - but beautiful nonetheless. Considering it further, my thoughts turned to my current relationship with Facebook and how I've been inching closer and closer to deleting my account. There's just so much stuff on there that doesn't interest me and, um, so much other stuff that kinda creeps me out. Regardless, I thought it'd be funny to quickly grab a few things from the top of my own Facebook feed and slap them into a mockup (above) of how Home might look to a regular person. I dunno about you, but there ain't too many models and professional photographers hanging around when I log in*. I've changed the names to protect the privacy of my friends. If any of you guys read this, please keep in mind that I just grabbed the first few 'normal' images I found. I hope I don't cause offence - I honestly do care about you, your cocktails and your interests - I'm just not sure I want them on the freakin' homepage of my phone. * saying that, there are a couple - what with having art-farty friends, but compared to people talking about football / work / the weather, they don't post much.